The title of my post this week is “An AESD March and a St. Pancras Draughtsman”. 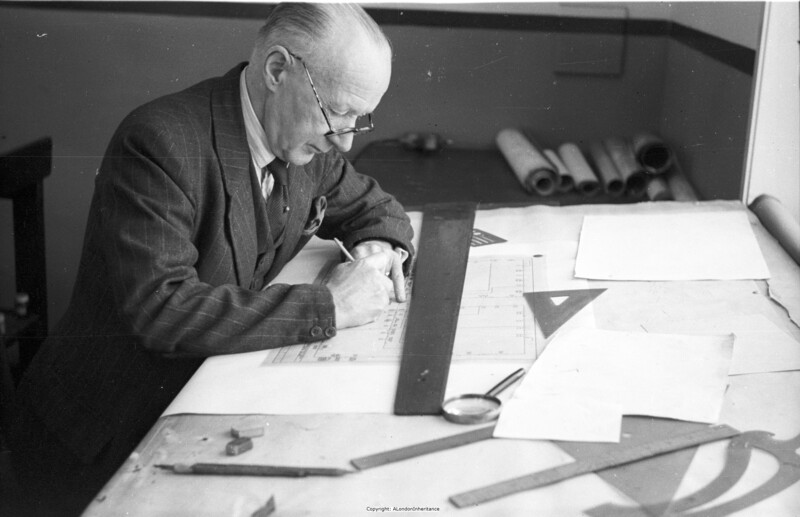 The AESD was the Association of Engineering and Shipbuilding Draughtsman, the trades union established in 1912 to represent Draughtsman working in these industries. After National Service, my father worked as a Draughtsman for the St. Pancras Borough Council Electricity and Public Lighting Department. 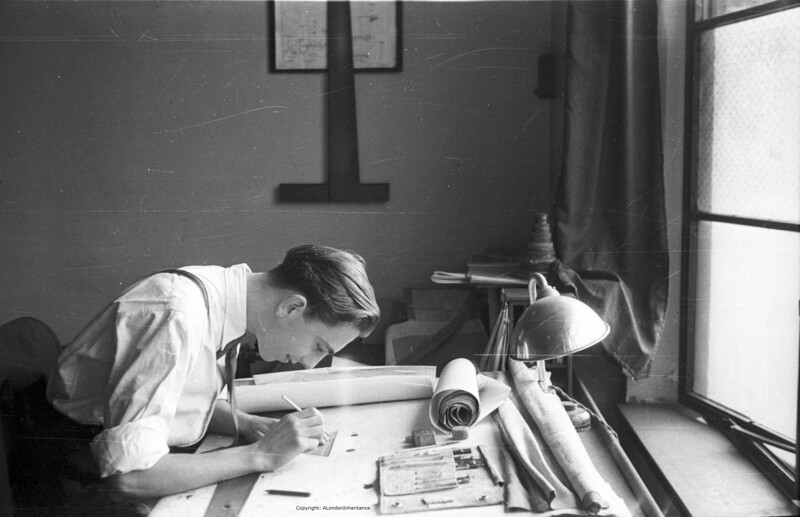 The job of the Draughtsman is one of those long replaced by computer based applications. It was the role of the Draughtsman to draw up plans, whether these be the design of a ship, train or plane, along with all the components that make up these complex systems along with drawing up street plans, building construction plans etc. It was a key role that enabled the installation or manufacturer of almost everything in an industrial society. 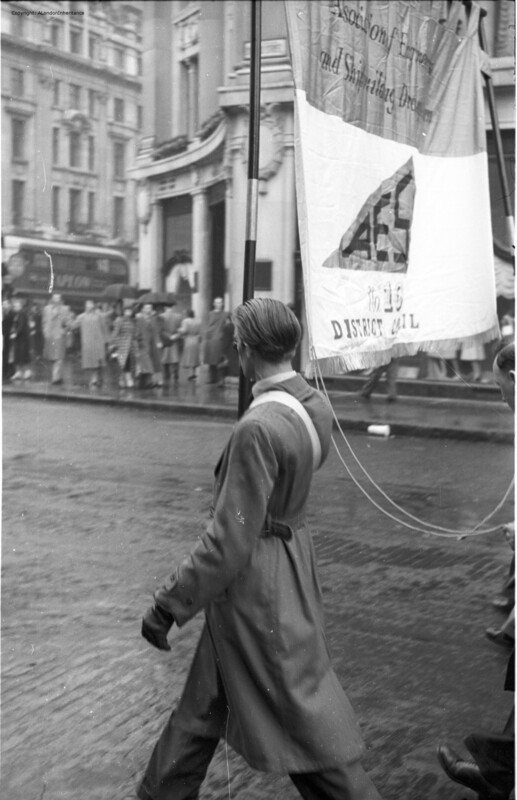 Within the photo collection, there are photos of a march by the AESD. I have no idea of whether he was a member of the AESD, was participating in the march or just there to take photographs. The following photo shows the AESD march about to reach Oxford Circus (I have included the rest of the photos of this march at the end of the post). Tool & Gauge Company in 1953. 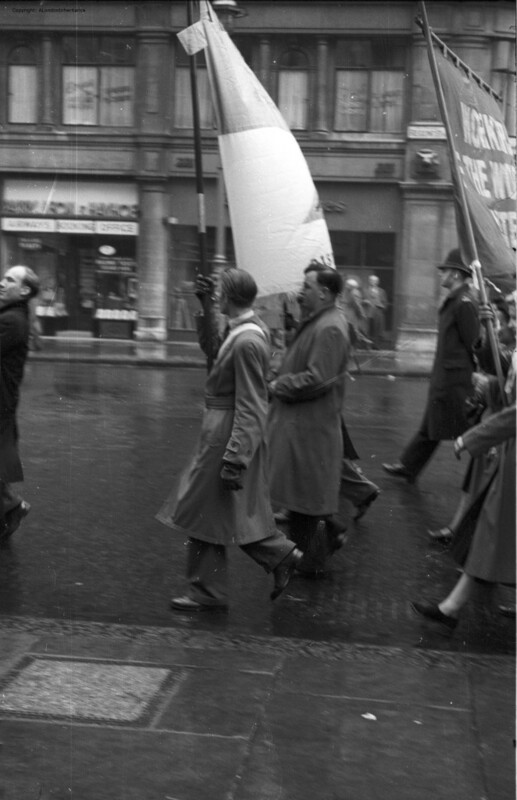 This lasted for five weeks from late August 1953 and did get national support, so this march may have been in support of this action. The dates fit well with other photos on the same set of negatives. 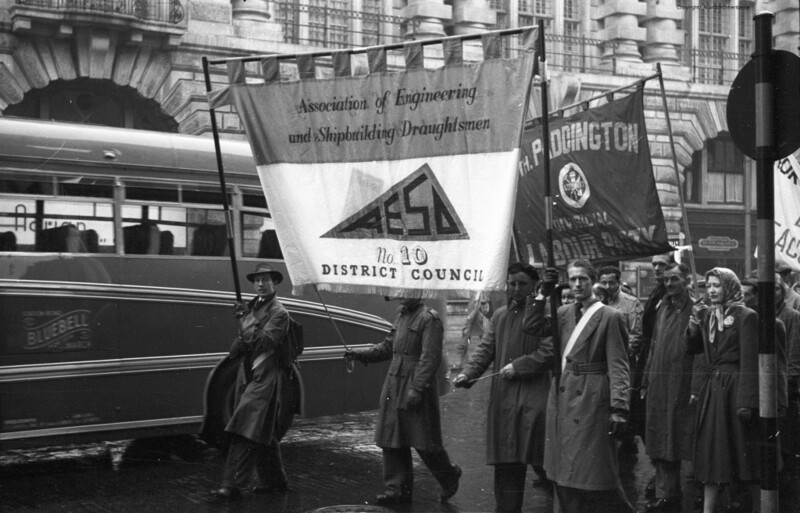 Like many small Associations and Unions representing specialised groups of workers, the AESD had to evolve and merge as the working landscape changed. 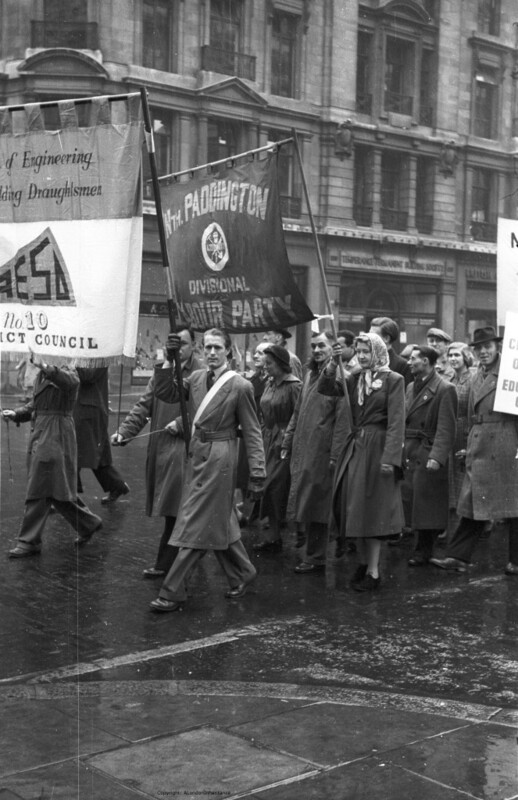 The AESD changed into the Draughtsman and Allied Technicians Union (DATA) to broaden the scope of membership. DATA then grew into the TASS (Technical, Administrative and Supervisory Staffs) which then became the MSF (Manufacturing, Science and Finance) following merger with the Association of Scientific, Technical and Managerial Staffs, which then merged with the Amalgamated Engineering and Electrical Union to form Amicus which then merged in 2007 with the Transport and General Workers Union to form Unite (I did not think it would be that complicated when I started checking !). The benefit of working for the St. Pancras Borough Council Electricity and Public Lighting Department is that this work took him across much of London, drawing street plans and where electrical installation work was required. A perfect job for someone who loved walking London. 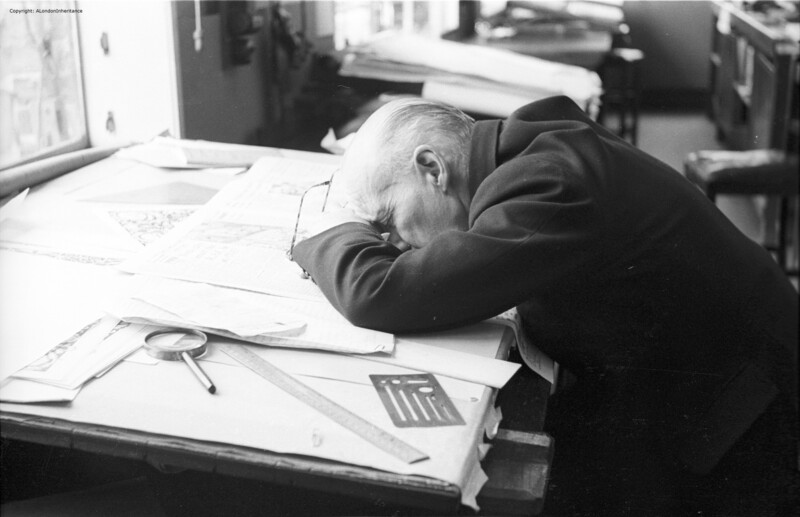 Plans were recorded onsite in a sketch book, then taken back to the office to be converted into large scale plans ready for work to be carried out. The left page covers Belgrave Square whilst the right shows the area around Grosvenor Gardens with Victoria Street, Buckingham Palace (B.P.) Road and Ebury Street. The markings are for the position of electric street lamps. The red line across the plan indicates that the transfer to a working plan had been completed. Street surveying and documenting was all done manually. This is before the days of GPS, theodolites with integrated electronic distance measuring etc. 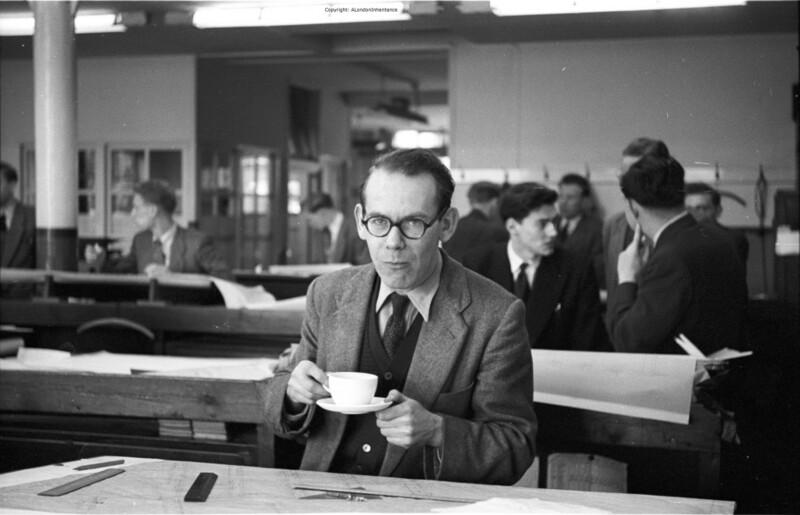 Within my father’s photo collection there are some photos he took of the St. Pancras Draughtsman’s office in which he worked. 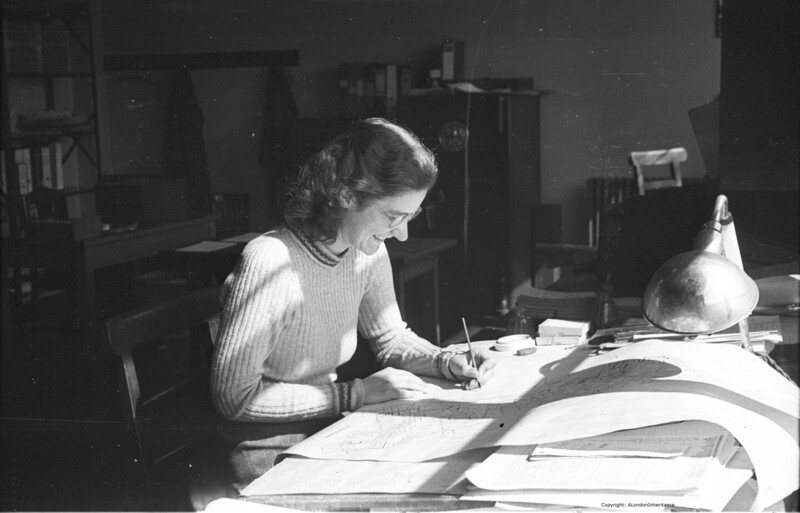 These show a very different working environment to that you would find today where this type of work is carried out on a computer with large screens showing the plans being developed. This type of work was very tiring as it required concentration, drawing to an accurate scale, very neat and standardised lettering, good eyesight and attention to detail. Note in the following photo the drawing tables placed against the windows. Natural light was still the best form of lighting in which to work. Also the magnifying glass for detailed work. 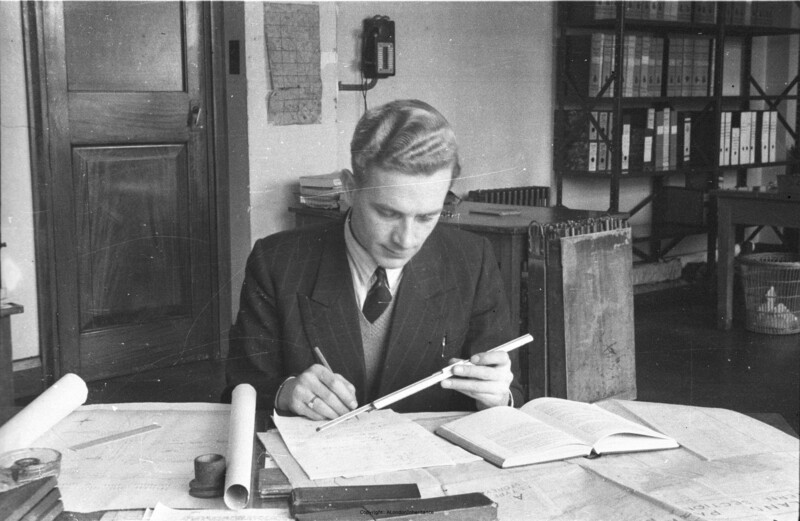 The instrument hanging on the wall in the following photo is a draughtsman T-Square. The shorter length was placed up against the side of the drawing table and the long edge ran across the table. This was then used as a guide for drawing horizontal lines and as a rest whilst general drawing. This entry was posted in London Characters on May 11, 2014 by admin. 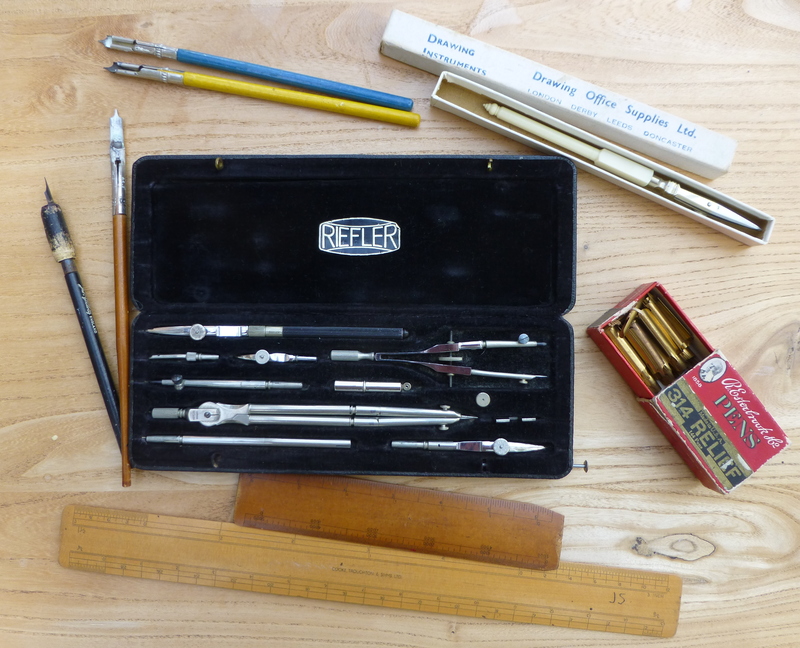 David, my father was also a draughtsman and I have a box of his tools just like the one in your photo. I also have some beautifully executed drawings which he did of his house. I would like to donate them to somewhere which would keep and appreciate them, but don’t know where to start. Do you have any ideas, please? Valerie, a very good question. Like you I have a number of my father’s drawings but I have not come across anywhere that would look after them for the long term. I know some local historical institutes are always on the lookout for material, for example in London the Bishopsgate Institute collect London related material. It was a real skill which with today’s computer generated drawings is getting lost. Intrigued that you state our father worked for St Pancars Borough Council Electricity and Public Lighting Department. By 1953 I would have expected that department, along with similar ones from other boroughs, woiuld have been transferred into the London Electricity Board. Did this happen to your father? Or did he stay with the Council? Council’s retained responsibility for the final surfacing of roads and paths, and for the street lighting, with all the other repsonibilities transferring into the Electricity Boards, which were created by an Act of Parliament in 1947. London has a rich and interesting history of the evolution of electricity supply, with parts of the City and West End still having a unique system (ie different in desgin and concept) to cope with both the high demand per unit area, and the exceptional need for reliability. 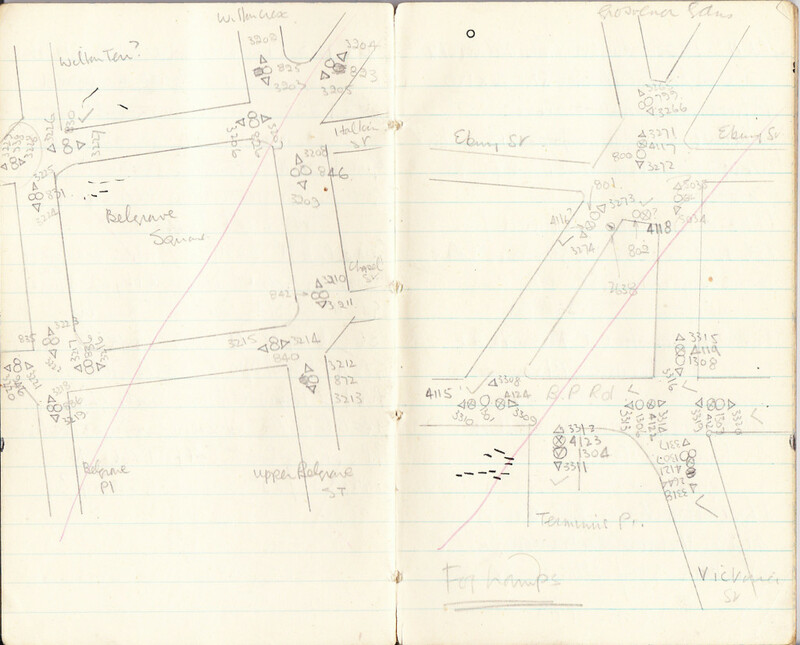 Mike, at the time he was still working for the council and from what I can gather from his notebooks it was mainly street lighting. The example I show in the post is typical with a series of streets and the positions of street lights marked. He did soon after transfer into the Electricity Board, however I have no idea why he stayed with the council for a period or the reason for the move to the electricity board. I also have some photos he took whilst out “on the job” showing workmen in trenches, jointing cables etc.